What is 1+1? 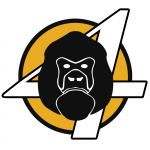 If you can answer that then you are well on your way to understanding what the Ape 4 Comics Podcast is up to. This episode Neil reads Batgirl #17 written by Brian Q. Miller and Matt reads Daredevil #10.1 by Mark Waid. 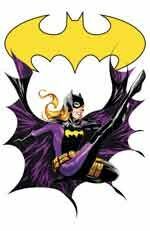 See why Neil agrees that Stephanie Brown must come back and why Matt has become a Mark Waid fan after just one read. The Special Feature this week talks about comic books to read when you are feeling under the weather. Matt and Neil discuss some books that may help take your mind off being sick! 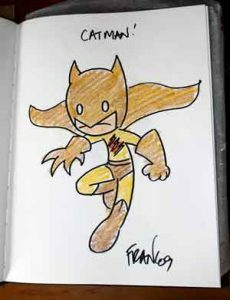 Scroll down to see the crayon drawing of Catman by Franco Aureliani that we mentioned in episode #1! Enjoy. Special Feature #1 (30:38) Good books to read when you are Under the Weather! As Promised a picture of Neil’s Catman Sketch done in Crayon courtesy of Franco Aureliani! Batman Annual #1 was not good. How they changed Mr. Freeze’s origin I thought was a total twist around, and not for the better. 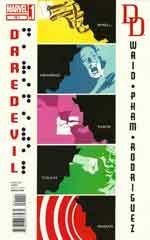 Daredevil 10.1 was amazing! Mark Waid has really taken Daredevil in a great direction. I’ve loved each issue so far! I also think Daredevil is the best Marvel is putting out right now, both for price and story. Could we possibly see Catman in the Earth 2 title? When it comes to my pull list, I think it’s a little bigger than my wallet, or my wife, would like, lol, but I’m glad that with what I’ve chosen, it’s staggered in when it comes out. I’m only dropping about $30 or so every two weeks. If I don’t like the title though, I’ll drop it. I’ve got all the Valiant titles, Earth 2, Batman, Winter Soldier, Daredevil, and Amazing Spider-Man. With my daughter, I think it’s more difficult to find a character, or characters that she can identify with than anything else. She’s gravitated toward the likes of Harley Quinn and Poison Ivy (from the animated series, as that’s what I let her see of them first) and Catwoman. She can’t grasp why they’re so different in the newer titles, but really likes how they were portrayed in the ’90’s. I’ve been pointing her more in the direction of the likes of Wonder Woman and She-Hulk (both of which she likes) but wheather she’ll stick with them or not remains to be seen. Loved the podcast! Great show, and you two work really well together! Can’t wait for the next episode!! Thanks Tim! Appreciate the feedback. Would love to see Catman anywhere at this point. Can’t wait for Valiant’s new Shadowman! Loving the show! Really excited to hear what you both say about the Casey Jones issue. I think it’s one of my favorite issues this year! Yes, Neil loves the Casey Jones book as did I. Episode #3 should be out in early October. @MattB I am super hyped about Shadowman’s return! I’m on issue 17 of his original run right now, and though it was slow going at first, it really picked up after issue 8. A great series so far, and I recommend it!